Critics called Cronenberg to task for not fooling the audience, but they missed the point. While that may have been a dramatic dynamic of the original theatrical production, Cronenberg is more interested in the way RenÃ© willingly, even aggressively embraces this fantasy, not caring about the reality beneath the role. 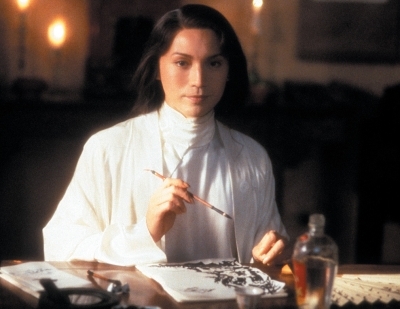 What makes Cronenberg’s M Butterfly so beautiful is not the fantasy of the opera, but the way it becomes warped in the real-world reflection. RenÃ© creates his own tragedy, but he’s confused the roles. By the time the finally affair plays out, he’s recast himself as the Butterfly of the story, the innocent romantic betrayed by the foreign lover. Irons plays the confrontation with his one-time Butterfly, now shed of his wings and the naked truth revealed, as a man betrayed, but it’s not the sexual identity that hurts. It’s the revelation of the mercenary, cynical person beneath the persona he loved that cuts him so deeply and he embraces his emotional wounds like a lover’s scar. More than a badge of his purity and idealism in a corrupted world, RenÃ© turns it into his own piece of theater and casts himself in the central role of the tragic diva. But Song has endured his own tragedy in the turmoil of the Cultural Revolution as well. No matter how effective he is as an intelligence agent siphoning off information from RenÃ©, he’s still an effeminate diva and a decadent artist, an embarrassment to the Communist ideal in need of reeducation. The other DVD debuts from Warner this week are: Michelangelo Antonioni’s Zabriskie Point, Hugh Hudson’s Revolution: Director’s Cut and John Boorman’s Beyond Rangoon. Kathleen Murphy’s essay on Boorman’s film will run later this week. Mamoru Oshiiâ€™s animated feature The Sky Crawlers is a more somber and contemplative film than most people would expect from the director of the Ghost in the Shell films, unless they had also seen his marvelous Patlabor films and observed his talent talent for creating pensive animation, foregrounding quiet and stillness and creating canvasses of small, subtle movements. That quality, which is also found in his Ghost in the Shell films (but usually forgotten in the splendor of his action scenes) becomes the foundation of The Sky Crawlers, a moody, introspective drama of perpetual war fought by corporate entities with private air forces of eternally young fighter pilots in an alternate reality Europe. Living abstract lives on eerily deserted air force bases, where they watch their comrades get replaced by identical copies, they slowly lose their emotional investment in life the longer they survive. Oshii makes the most of his talent for creating pensive animation, foregrounding quiet and stillness and creating canvasses of small, subtle movements, and the mix of traditional cel animation (for the characters) and 3D CGI (for the planes and the backgrounds) gives it a surreal, hypnotic quality broken only by the dynamic scenes of battle, which Oshii shoots in a photo-realistic style with rapid movement and dramatic camerawork in sharp contrast to the long, static takes of the base scenes. It doesn’t just shatter the unnatural peace of the ghost towns of the air bases, it exists in its own hyperreal/surreal plane, where war has become a commodity and the forever young kildren, genetically altered anomalies from a failed experiment whose existence is still under patent to the corporate warriors, are sacrificed to the machine. No civilians were harmed in the making of this war. And no American animated feature would tackle anything like this. The Blu-ray debut of the first six Star Trek feature films collects the first six features, the films featuring the original bridge crew, in a supplement-packed box set. All the supplements of the previous DVD special editions are included along with all new commentary tracks (by series historians and producers from The Next Generation of the show), new featurettes and the Blu-ray exclusive “Library Computer,” offering interactive access to intergalactic trivia with the flick of a button. No self-respecting Trekkie would bother with that since it’s all pretty obvious trivia, and the rest of us would just as soon watch the film and not worry about all the rest. But what is worth checking out is the bonus seventh disc featuring The Captain’s Summit, an unaccountably entertaining roundtable discussion with William Shatner, Leonard Nimoy, Patrick Stewart, Jonathan Frakes and host/moderator Whoopi Goldberg. In the words of Shatner, they’re just “hanging out,” sharing their experiences and reflections on the show and its legacy with a lot of laughs and good humor. They turn out to be great company and fine raconteurs. Suggestions of ego flare up between Shatner and Nimoy, only to be quickly extinguished as old news between old friends, and it’s obvious that Stewart and Frakes simply don’t have the same emotional investment in the series that Shatner (and to a lesser extent Nimoy) still does. But mostly it is just fine company, a group of professionals sharing stories about working in the same industry (the Star Trek industry specifically) and finding plenty of humor in shared experiences.